I expect you know what this post is all about – yep, Paint! 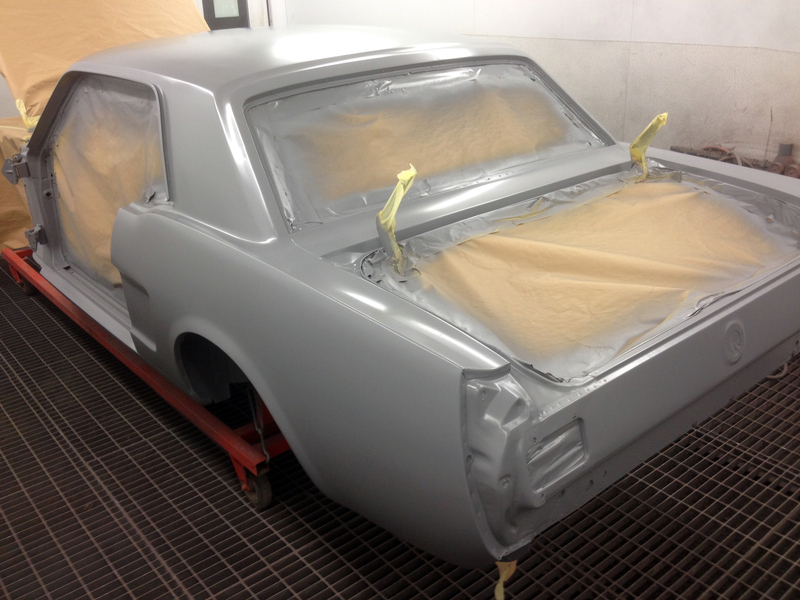 The guys at Mustang Maniac have been brilliant this week with guidance on what I need to do on my engine and Adam has sent me photo’s of my car in the paint shop. There are a lot more pictures that I will post of the paint shop, but as yet I haven’t had a chance to edit and upload them yet. So without any more words here are the pictures I have dreamt of for so long now and it’s only in primer. A big picture post but you gotta see it all! 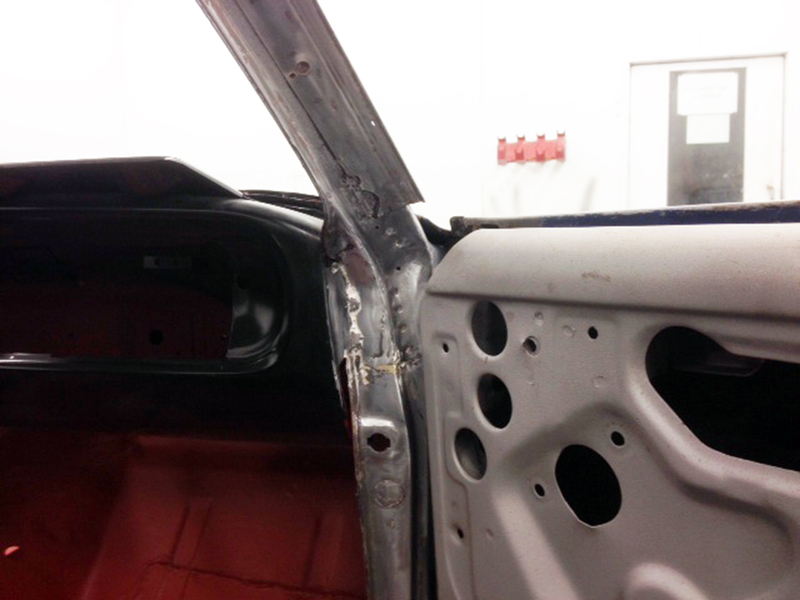 The car was taken apart and covered for each panel to receive the final filler skims. 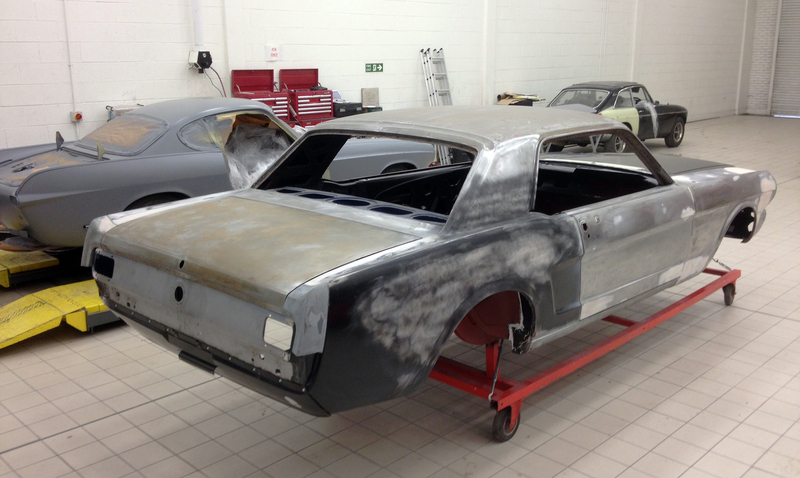 The car was taken back to bare metal and all surface rust was removed. Any spots that needed treatment were either treated or a small plate was added, as was the case on this A post here. 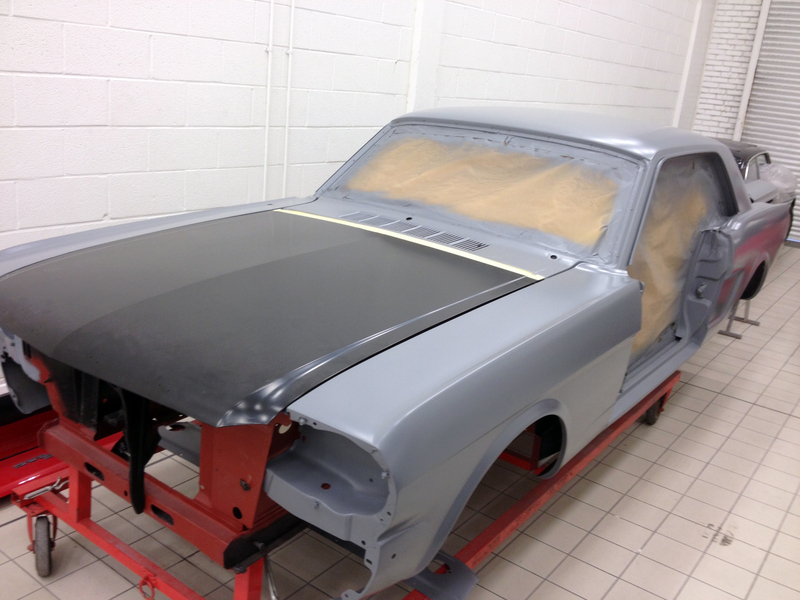 The car was then masked up and all the panels were laid out ready for a skim of filler. 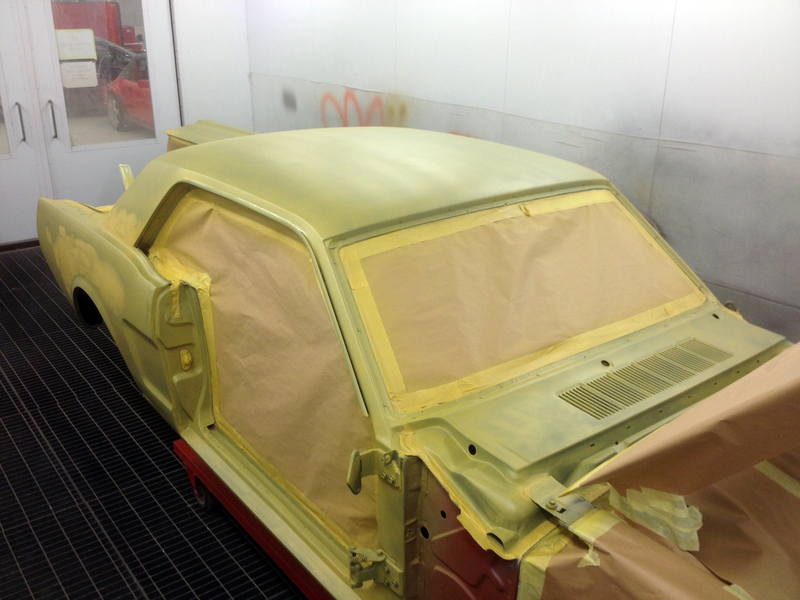 The panels have a dye coat lightly sprayed over the primer to see the high and low spots for the filler. 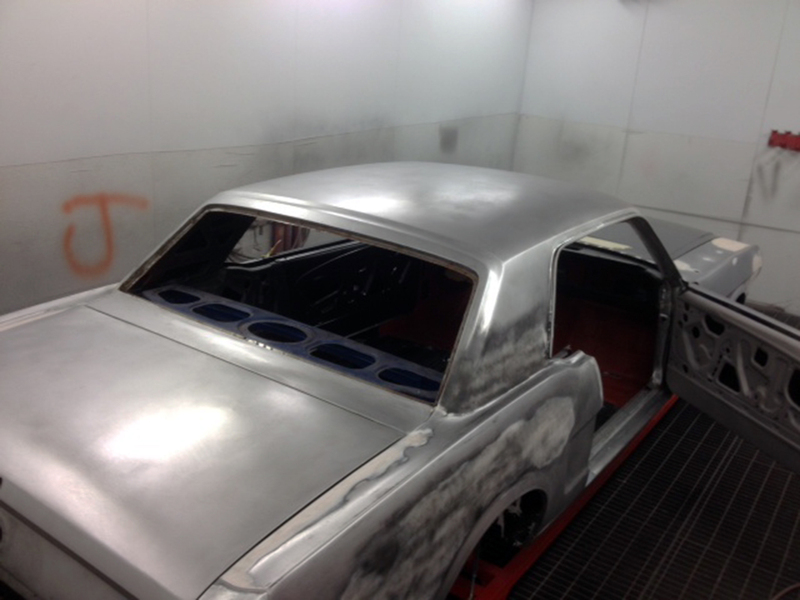 The next stage was the etch primer to eat into the metal to hold the base coat or primer. This was done very quickly to stop the creep of rust back again onto the surface. The next steps of the process are to spray with primer, add more filler and block down. This will be repeated three times with ever-increasing fine block papers so there is a mirror like smooth finish to the primer. The car in the first phase of primer, the hood is to be completed at this point obviously. I am so excited to see these pictures, you have no idea just how much! While all this was going on the next major item will be the engine. This will be mounted into the shell as soon as we can as the drive train and the suspension will need to be fitted. The engine was obviously caked in all sorts of road gunge and old oil from various leaks. The technic is to degrease it and then use the Mustang Maniac steam jet wash to take the debris off. I attacked the deposits with a good soak with Jizer and then I brushed in another coating into all the little gaps. Steam cleaner taking the debris off. The engine dried out pretty quickly and the nice weather helped. The intake manifold was unbolted to expose the inner workings of the push rods. The engine was inverted again and dried out once again overnight. The remaining flakey paint was brushed off and a small air buff tool to make life a bit easier. All the facing surfaces that have a gasket need to be cleaned and a buffed to a shine ready to take the gaskets at a later date. The engines were block painted once they were assembled. so to see the engine all one colour is actually correct. There were various colours for various years. The colour painted could also depend on the factory that was assembling the engine or the car, in my case the home for Ford – Dearborn. The engine was given two coats working around the engine. In order to make the paint dry a hot air gun was used to take the tack of the paint ready for a second coat. The second coat incorporates the water pump and front of engine. once that was completed I was able to work around the engine block and headers for the final coat. By the time I had completed the block second coat the front was ready for its final coat. Spark plugs were lightly screwed in to keep the bores clean while in storage. Some small detailing will need to be completed but I will take pics soon. The final step will be to rebuff the face plates again to get the over paint off so there is no high spots for the gaskets. Another big post but it’s worth it. This entry was posted in Car, General, Photo's and tagged 289cid, block sanding, Dearborn, dye coat, engine, etch primer, ford, Jizer, Mustang, Mustang Maniac, One man and his Mustang, paint shop, steam cleaner. Bookmark the permalink. Happy and excited for you as you experience that magical process of putting the color to your Mustang! enjoy! All of a sudden we get to this point, exciting times. Thank you. I can’t wait to see it. Wow! Wow! Wow! Things are really coming together now! Hi Mart – what paint was used for the engine and how was it applied (I.e. Brush or spray)? Exciting times as this car really comes together! The paint is made by Classic Transport engine enamel, the colour is called Ford dark blue. It was painted on with a 1″ brush over two fairly thick coats. Although its called dark blue its not that dark, the ’67 colour is corporate blue and that is realy dark and like the modern ford badges. There are about three different shades of blue, i tried them all and preferred this one.